Phoenix Suns season got underway last night at Talking Stick Arena against the Dallas Mavericks. Both teams are coming off of a disappointing season last year. Dallas Mavericks finished last season winning just three more games then the Phoenix Suns. With the addition of DeAndre Jordan the Mavericks look to add depth to their back court. Jordan signed a one – year deal with the Mavericks in the offseason. The number third overall pick Luka Doncic makes his season debut against the top pick in the draft class DeAndre Ayton. Both rookies put up great numbers in their season debut for their teams. 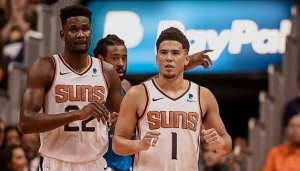 The Phoenix Suns didn’t wait long before they started working DeAndre Ayton in the mix on offense. Ayton scoring the first five points of the game putting the Suns up early on gave the rookie confidence. Ayton’s first points came on a made shooting foul on Doncic in the first quarter. Ayton showed big presents underneath for the Suns against the Mavericks. When Ayton was in the game the Suns played a different type of basketball everyone on the team showed confidence when Ayton was the big man down low. Ayton finished the night with 36 minutes of action 18 points 10 rebounds on 8/11 shooting and dished out 6 assist in the 121-100 victory over the Mavericks. Ayton wasn’t the only Sun to have an outstanding game last night. Just five weeks ago Devin Booker underwent hand surgery and was unsure if he would be ready for the season opener. Earlier last week Booker was spotted shooting free throws with his left hand. Let’s go ahead and look to opening night Devin Booker was dressed and ready to start opening night. In the first 24 minutes of play, Booker had 13 points. Suns were led by Trevor Ariza in the first half of last night game. It wasn’t until rookie Jalen Brunson of the Mavericks brought the game within 4 points 94-90. Devin Booker took commanding control of the game scoring 19 of the Suns final 38 points. Booker ended the night with 35 points on 12/19 shooting and 6/10 from deep. The Phoenix Suns are the youngest team this season in the NBA but one of the most talented team. The Suns have room for growth but with the veteran presence of Jamal Crawford on the bench will help mentor the youth on this team. Suns have the first road test this Saturday as they travel to Denver to face the Nuggets and Golden State before they head home to face the LA Lakers next Wednesday.